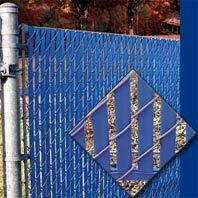 The Bottom-Locking Slats provide an economical and attractive way to enhance any chain link fence. Filtrona Extrusion is the largest manufacturer of Bottom-Locking Slats, which are marketed under the PDS® brand name. With over 25 years of experience extruding this product and an exclusive, patented, locking design, you can be assured of the highest standards in quality - from the raw materials used in manufacturing to the finished product in your fence. Please note: Bottom Locking are not for use on Galvanised mesh. See product PDF please note Scenic Products only stocks 6ft in White, Green, Black & Light Blue. 8ft only in Green. As an alternative approach to our Bottom-Locking Slats, the Top-Locking Slats also provide an economical and attractive way to enhance any chain link fence. The locking system is located near the top of the slats to ensure a clean, straight edge, further enhancing its appearance. See product PDF please note Scenic Products stocks 6ft in most colours. 8ft in Green, Black & Beige. 10ft in Green & Black. 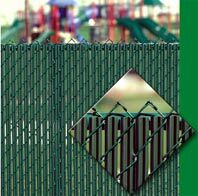 Our LiteLink™ slat is one of the most economical chain-link enhancement products available in the market today. 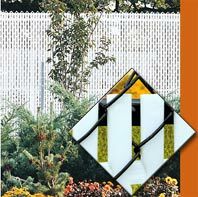 Manufactured using the same durable outdoor plastic as our standard tubular fence slats, this single wall "M" shaped slat will give you the visual screening and color enhancement you desire at a very affordable price. LiteLink also uses our patented Bottom-Locking system for fast and easy installation. See product PDF please note Scenic Products only stocks 6ft in Green & Black. 8ft only in Black. When you need increased privacy, our Winged Slat® is the answer. With the proven quality and durability of our standard slats plus unique "wings" for extra screening and security, these slats are selflocking - no channels are needed! See product PDF please note Scenic Products only stocks 6ft in Green & 7ft in Beige. Safety Top Cap™ serves two purposes. 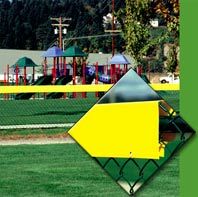 First, its unique design provides protection against bodily injury by covering the exposed knuckles or barbs on top of a chain link fence. Second, it displays nicely as a decorative trim piece to compliment any galvanized or colored chain link fence system. See product PDF please note Scenic Products stocks Safety Top Cap in Yellow, Green & Black. HedgeLink™ is one of the most unique styles of chain link enhancement available from Filtrona Extrusion. 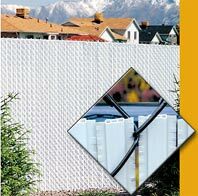 This product creates a natural hedge look on chain link fence, and requires no maintenance. 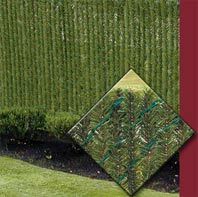 See product PDF please note Scenic Products only stocks 6ft in Green & 8ft Green.